ISLAMABAD, Apr 8 (APP): Prime Minister Muhammad Nawaz Sharif Saturday said the relations between Pakistan and Saudi Arabia have become closer and stronger and the peoples of both countries have lot of respect for each other. The Prime Minister was talking to Imaam-e-Ka’abah Sheikh Saleh Bin Muhammad Bin Talib who called on him here, according to a PM Office media wing a press release. The Prime Minister warmly welcomed the Imaam-e-Ka’abah to Pakistan and said the people of Pakistan attached great religious and spiritual attachment with the Kingdom of Saudi Arabia due to location of the Holy Kabbah. He said though Pakistan and Saudi Arabia were geographically located apart but mutual Islamic and cultural values have kept their hearts together. The Prime Minister emphasized that Islam was the message of love, peace, patience, forgiveness and respect for humanity and it was the need of the time to spread this message all over the world. He said the religious leaders and scholars should unanimously counter negative propaganda, being wrongly portrayed against Islam. Imaam-e-Ka’abah thanked the Prime Minister for the warm welcome, accorded to him in Pakistan. 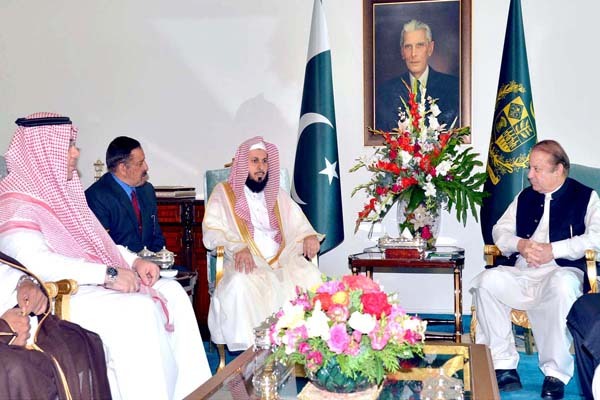 Habeebullah Al-Bokhari, acting ambassador of Saudi Arabia, Minister for Religious Affairs Sardar Muhammad Yousaf and other senior officials were also present during the meeting.